Quality solid copper lettering 150mm high, 3mm thick, with a brushed face and clear protective coating made in a Times Roman font. Threaded rod fixings on the back for fixing on walls for exterior or interior use. An ideal solution for prestigious architectural sign solutions. Manufactured for the purpose of longevity. The neverend sign solution for naming a property or business. This particular job was made for the purpose of fixing to a shop for a prestigious hair design studio. The images above show lettering with a brushed verticle grain on the face. We also make the letters with a horizontal brushed grain. Horizontal brushed grain is produced as standard unless otherwise requested by the customer. 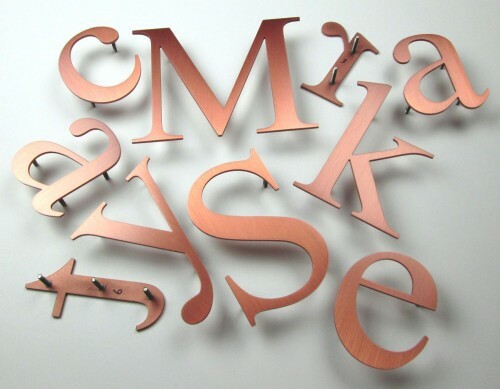 Copper letters are profile laser cut from 3mm thick or 6mm thick sheet material. 9mm thick letters are also available depending on stock levels. All lettering are custom cut to order from a wide choice of over 1000 fonts. We can cut letters from your own artwork. Copper logos may be cut from customers own artwork. Artwork required for cutting would need to be vector eps or ai files. Letters are clear protective coated with a durable polyurethane. 25mm long threaded rods are stud welded to the back of the letters. 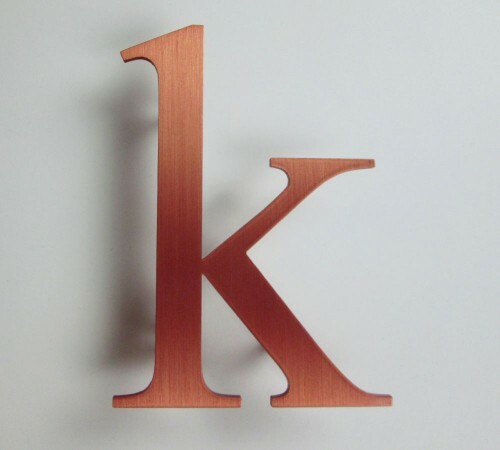 Letters may be supplied without fixings when customer requires the letters to be glued instead. For a beautiful looking, different, individual feel to a sign look no further than copper for your architectural sign requirements. For advice and a price send us an email with your requirements.